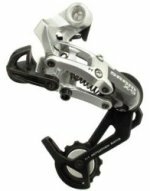 Top range SRAM X9 Derailleur for MTB, short, medium and long cages. High performance and tons of style guaranteed. Heavily inspired by X.0, with materials and technologies to meet the demands of any rider. New features for the 2007 X9 Trigger Shifters include SRAM's ZERO Loss Travel, and adjustable clamp positions, just like it's bigger brother X.0. Features a forged B-Knuckle for improved stiffness. * Technology: 1:1 actuation ratio and Direct Route Technology for lighter effort shifting. Speeds: 9/8. Material: Aluminium alloy - Composite cages (short Cage option only). Compatibility: SRAM 1:1 shifters (triggers and twisters). Available cage lengths: Long, medium (Aluminium), short (Composite). Colours: Polished. Weight: 230g / 227g / 212g.